A cover letter is accompanied with a resume when applying for a job opening in an organization. Most of the time, the organization itself mentions the requirement of a cover letter for resume for candidates. However, if the requirement is not categorically mentioned, one should still send a cover letter. It shows a high level of interest on the candidate’s part which is a good sign for the hiring team. The cover letter examples help you in highlighting the most relevant professional experiences and also how your experience and skills will be useful for the organization. One thing about cover letters is often not discussed is the flair that it should be written with. Some people try too hard and end with a highly intricate cover letter which can be a disadvantage. One should try to keep their cover letter as simple as possible. When we say simple, we mean it for the language and layout and not your ambitions and achievements. 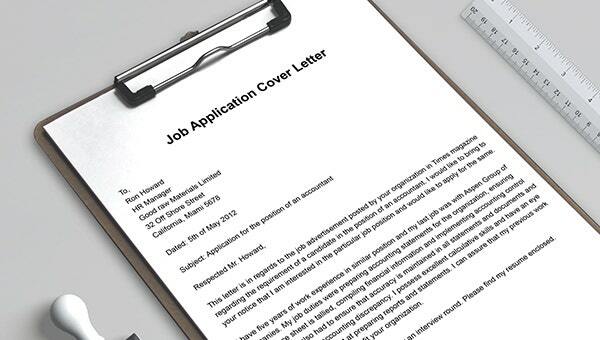 Why Should a Cover Letter be Simple? When it comes to cover letter template the shorter and the simpler, the better. It should not exceed than a page and should only highlight relevant experience and qualification and what the applicant can offer to the organization. Therefore keep it simple and concise. This is required mainly because the people at the hiring position do not want to take too much time on a single cover letter. Presumably, they have a lot many cover letter to go through in a day and they want to keep the process less time-consuming. It is better to be clear in what has been written in the cover letter so that it can be understood in a quick glance as well. How to Create A Simple Cover Letter? Creating something simple can often ironically be a difficult task. Same goes for the cover letter. Therefore, we decided to provide with some valuable tips that can help you create a brief, simple and crisp cover letter. You mainly have to focus on what the employer wants to see and the problem will be solved. First of all, you should know that it is important to keep a good amount of whitespace in the cover letter so that it is easy to read. Add a double at the end of each paragraph and it will make a huge difference. The more paragraphs you add the longer the letter gets and the more complicated it appears. Limit your cover letter to 3 paragraphs at the max. The first paragraph should list your experience and strengths, the next paragraph can tell why you are applying for this position and why are you suitable for it and the last paragraph should include the closing greeting along with an inquiry about the further process along with your name and contact information. Keep each paragraph brief and concise and avoid elaborate statements. Keep the information well organized and use bullet points for easy assistance to the reader. Re-read the cover letter and keeping taking out points that you think are unnecessary and try and keep the job application letter simple. The rule of keeping things short and simple is very practical and effective. It can be a lot beneficial if applied white writing cover letter as well. The brevity and simplicity will surely leave a great impression on the hiring team.